Since I am such a big fan of stories that put a strong emphasis on the heroine’s journey, it’s no surprise that historical westerns are among some of my favorite reads. With frontier-style stories, the heroines need to be savvy and smart. If they aren’t somewhat adaptable? Yeah, they’re dead. Their main concern isn’t catching some rake’s attention, it’s do I have enough food to survive the winter. Historical western heroines tend to have “real” problems. Also, out on the frontier, they’re away from civilization, making it easier for them to experiment and not be fenced in by strict societal mores. This allows the author plenty of leeway when it comes to “historical accuracy” and it allows the heroine to be adventurous without some sour society matron breathing down their neck. 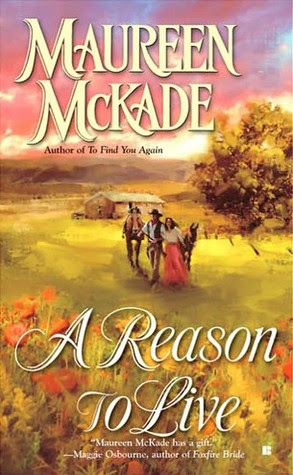 A Reason To Live by Maureen McKade is a gut-wrenching story about a former Civil War nurse, cut off from her family, suffering from post-traumatic stress. Being the late 1860s, nobody knows what PTSD is, and she thinks she’s going crazy. She decides that, before she completely succumbs to madness, she needs to deliver the last dying words of some of her former patients. Read this book with a box of tissues handy – you’re going to need them! Heartbreaker by Nicole Jordan is a book I really need to reread one of these days, but one that stuck with me because I inhaled it in one sitting (a rarity for me) back in the day. It’s one of those Perfect Dead First Wife books featuring a Jackass Alpha hero. What I liked about this story though was the heroine. It’s amazing how tolerant I am of Jackass Alphas when the heroine isn’t a simpering ninny cowering in the corner. Oh no! Our girl has a spine! She fights back! Hooray! Maggie Osborne built her career on unconventional heroines with gumption and vulnerability. Since this probably shouldn’t be an Osborne Love Fest, I’ll just talk about two of my favorites. 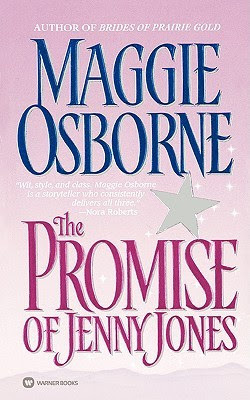 The Promise Of Jenny Jones finds our heroine getting sprung from the hangman’s noose by a dying mother. Her only request? Take her daughter to her father, and away from her slimy relatives who want the kid dead. The fly in the ointment? Jenny doesn’t like kids and the kid doesn’t like Jenny. 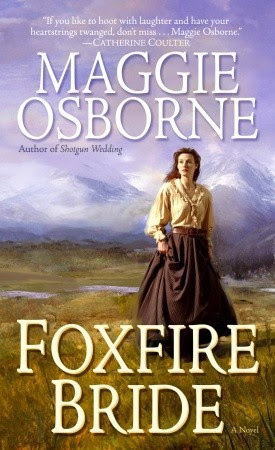 Foxfire Bride features a heroine who made a name for herself by traveling the west, alone. She was a skilled tracker in high demand, until she got sidelined thanks to a competitor. With time to brood, she gets it in her head to confront the hoity-toity man she feels stole her birthright. When the greenhorn hero hires her to take him, two armed guards, and a pile of money to Denver? She’s on her way! Hope’s Captive by Kate Lyon is a perfect example of not judging a book by its cover. Kidnapped by Indians as a child, the heroine is eventually sent back to “her people” by a famous chief. Naturally, the reception isn’t stellar. She is rumored to be one of the chief’s squaws, so she’s labeled a whore and damaged goods. She gets word that the tribe that treated her so well is being carted off their land, forced on to a squalid reservation. They’re sick, starving, and many of them are dying. She’s determined to get supplies to them, and finds a traveling companion when the hero knocks on her door. These are really just a few of some of my favorites. I have a soft spot for strong, yet vulnerable heroines – and I really believe that it’s one of the big reasons why historical westerns continue to resonate with me. Even considering I’ve been reading the romance genre for almost 15 years. Tastes change, trends come, trends go, and I’ve been known to declare myself “over” or “burnt out” on certain themes, time period, and tropes. But historical westerns with heroines like these? I don’t think I’ll ever find myself bored. You are killing me with these recs. I read the Jordan eons ago but am afraid to re-read it as well. My TBR is shaking it's metaphorical fist at you Wendy! I've not really been a big western fan but those books are mighty tempting. How much do you miss Maggie Osbourne? And that McKade sounds FANTASTIC!! Molly: I miss Maggie Osborne - like whoa! Her western heroines are really the gold standard for me. Want to know why I like historical westerns so much? Read an Osborne heroine - that pretty well sums it up. And I love that McKade book. It's seriously gut-wrenching. I hope you like it too!